You would not think there would be fine art painting classes right here in Jefferson but there are every month. 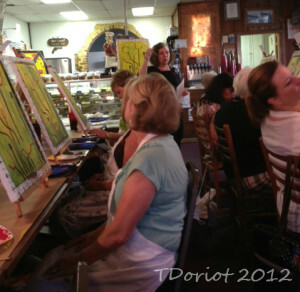 The owner of the Bakery restaurant has chosen to have art painting classes in her restaurant for the past few months. The instructors from The ART Event come to Jefferson one night a month to teach a class using their patent pending techniques so easy that everyone walks out the door with a masterpiece they have painted with their own hands. This week was my second time and I have to say that it does get easier with each painting. The poppy painting this week was really fun we even got our hands dirty with some old fashioned finger painting. 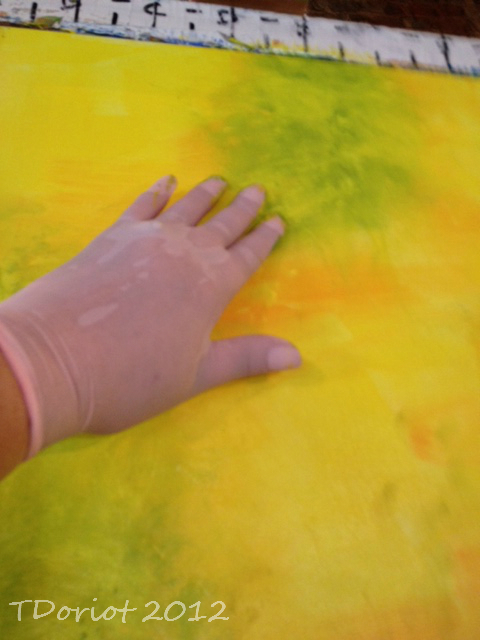 I had a glove on this hand and mysteriously got more paint on my right hand. Even if you think you can’t paint or draw stick figures not to worry, the techniques are very easy to follow along. It is exciting to see a very blank white canvas become something uniquely beautiful painted by you in a three hour time span. Every person adds their own flair to each painting just by virtue of their individualism. It is fun to take a walk around the room and see them all taking shape, some are bolder and brighter, some soft and light, some might have a little extra added element from the artists own imagination. The poppies are taking shape nicely. 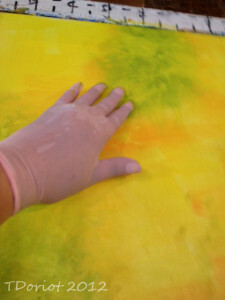 With each new painting we learn a few new techniques from putting dots in locations with either a pen or a brush to using your fingers to really smear paint around on the canvas to using markers for fine detail work. You really can’t go wrong taking one of the classes. As I’m writing this today it occurs to me this would be a really fun thing to do with your girlfriends for an evening. The next class is on Tuesday August 21st at 5:30 pm so you would have plenty of time to shop, dine, boat ride or just relax before the class and dinner is included with the price. 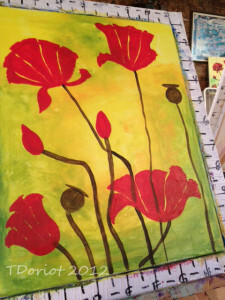 My poppies almost finished, it just needs the fine details. 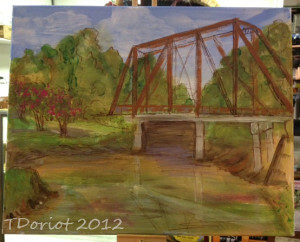 Next month’s class is a painting of the iconic trestle bridge in Jefferson that spans the bayou, what a treat this one will be. In fact more of the paintings will be Jefferson themed in the coming months. Tuesday Class on August 21, 2012. The Jefferson Trestle bridge. 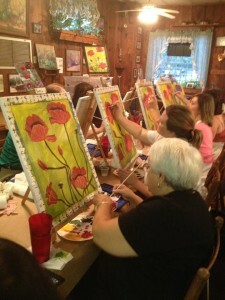 To sign up for the classes call the Bakery Restaurant at 903-665-2253 and get your name on the list early. The class needs to be prepaid to guarantee your spot. 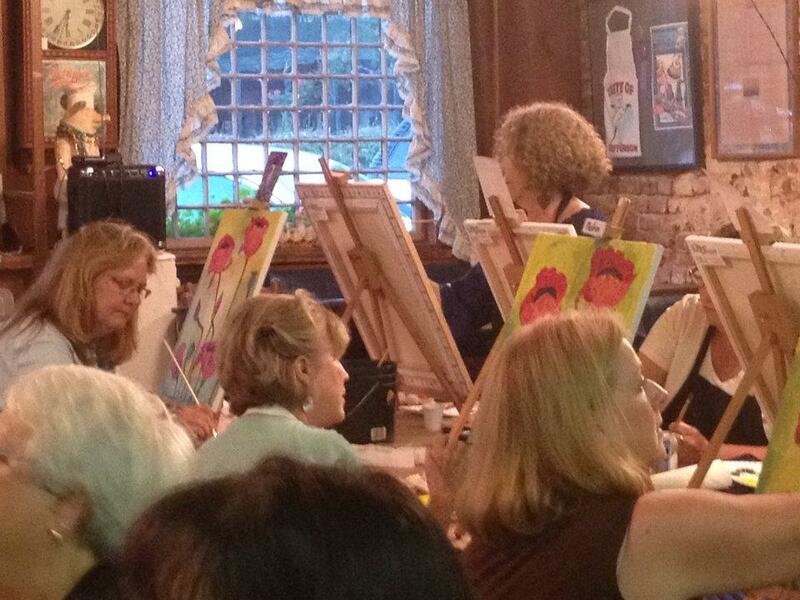 Lynn caught me intently concentrating on my painting. 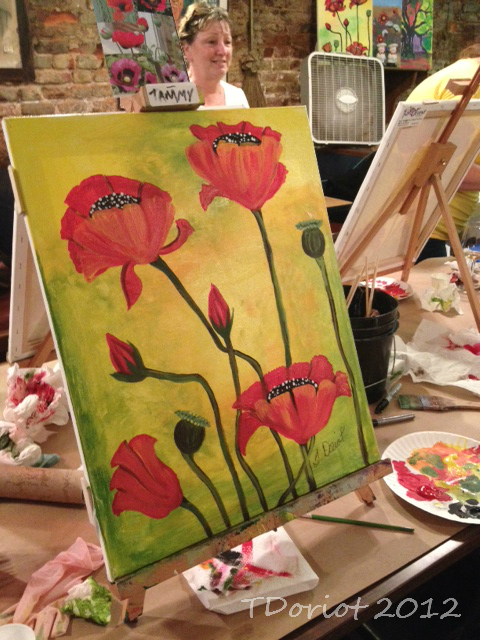 This entry was posted in Around Town, Special Events by Tammy D. Bookmark the permalink.